TÁNAISTE JOAN BURTON has given an official statement to Gardaí about the events of last weekend in the Dublin suburb of Jobstown — when she was pelted with a water balloon before being trapped in her car for almost three hours by angry protesters. Anti-water charges prevented the Labour leader’s car from leaving the Cósan adult education centre on Saturday — a move that’s come in for sharp criticism from coalition and many opposition TDs. “She was asked by the guards to provide a statement about last Saturday,” a spokesperson said this evening. So there was an officer in with her today in her office in Leinster House and she went through what she saw and heard and what happened to her. 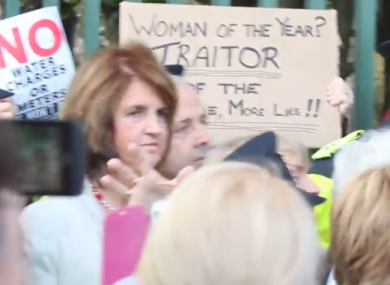 The grassroots protesters also hurled sexist abuse at the Tánaiste, and banged on her car chanting slogans. She was eventually escorted away by gardaí in a patrol car, after a tense stand-off with demonstrators that saw the Public Order Unit and dozens of back-up gardaí called in. “I was concerned if the [car] doors were opened what would happen next,” Burton said in an interview with Newstalk earlier. She said that language “heavily-loaded with sexual imagery against women” was shouted at her and her assistant while protesters clamoured outside the car. Anti Austerity TD Paul Murphy, who attended the action and took on a leading role as it developed, has repeatedly insisted in recent days that it was justified and largely peaceful. Email “Joan Burton's given an official Garda statement about Jobstown”. Feedback on “Joan Burton's given an official Garda statement about Jobstown”.